There are 65 posts filed in DayTradeToWin (this is page 2 of 7). What are the best 2018 trading strategies? 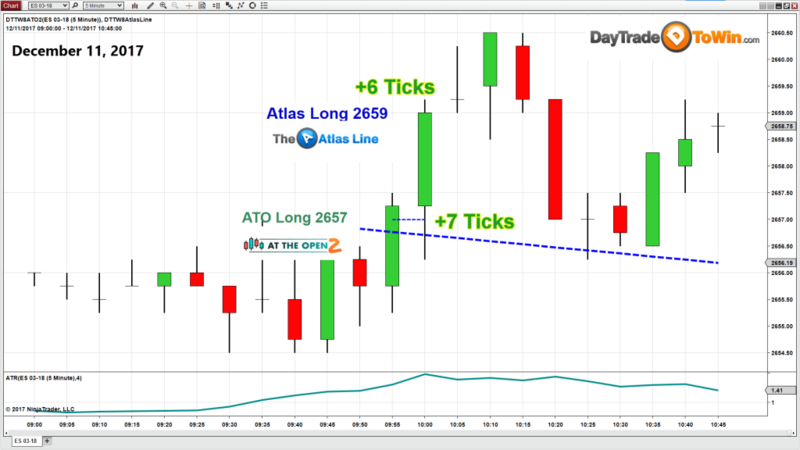 We expect many great trading opportunities with the ATO 2, Atlas Line, Trade Scalper, and others. Generally, the first week of a new year has greater volatility, which means better trading in most cases. Also, by the end of the month, we will know if 2018 will be a year where we can use the January Effect strategy. Look for another post soon with the details. If 2018 will be anything like 2017, we can expect a trend up with many long retracement opportunities. For now, let’s focus on the ATO 2, Atlas Line, and our other trading strategies. 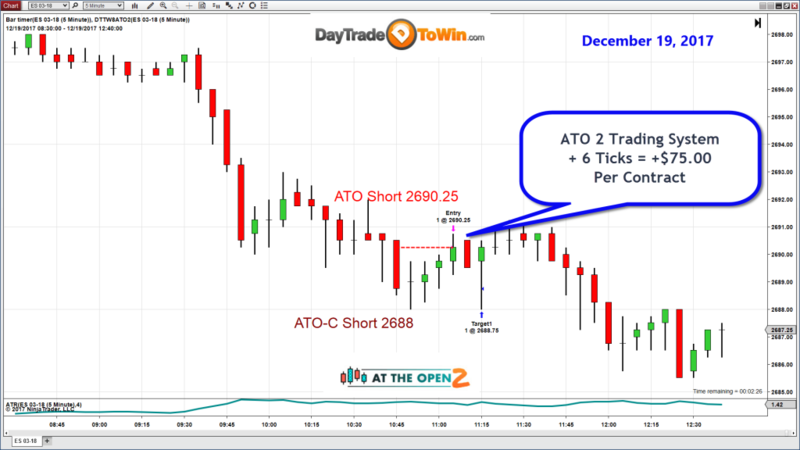 In the video below, you will see how the ATO 2 and Atlas Line performed despite low volatility. The trade signals and video footage is for December 28, 2017. During the last week of the year, because of the holidays, the markets tend to be slower. Want to be a pro trader in 2018. Our next Group Mentorship Program begins in just a few short days. 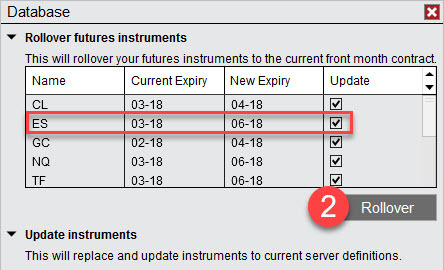 Did you have any winning trades for December 28, 2017? The E-mini’s ATR only reached 1.25 points (we set the ATR to a value of four). That’s pretty slow. However, the ATO 2 and Atlas Line produced successful signals. 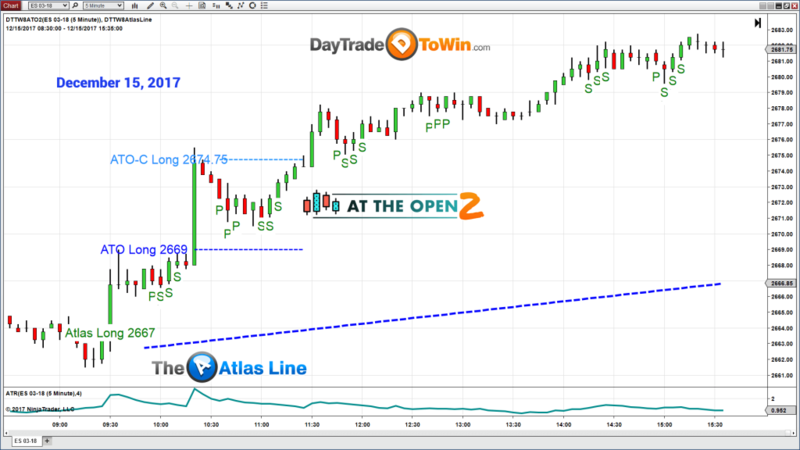 When two trading strategies confirm market direction, John Paul believes there may be a better winning chance. He also says that when trading his methods, take whatever trade comes first. In this case, the ATO 2 signal appeared before the Atlas Line signal. 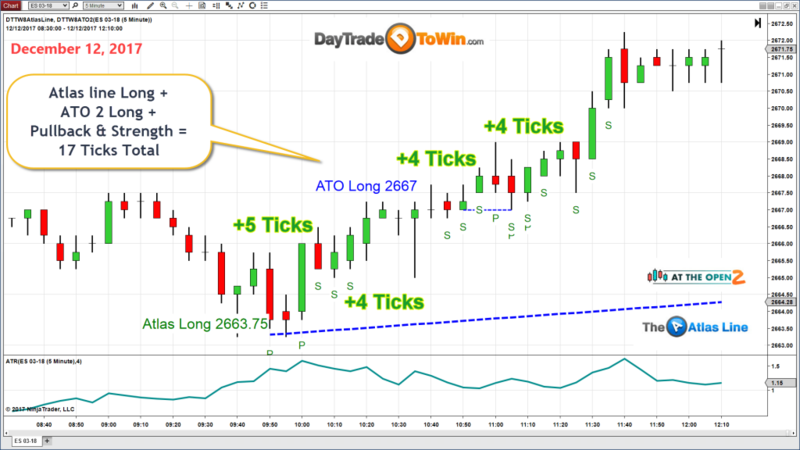 Watch the above video’s real-time trade to see how he handled one of the signals. One component of being a successful trader is knowing how to manage trades effectively. Trade management involves limiting risk and maximizing potential reward by strategically adjusting the parameters of the trade you’re in while it’s happening. Because 2018 trading strategies are a hot topic and there’s such variety, we carefully explain the trade management rules during the live training and training videos you receive with purchase. The trading methods you learn are based on price action. Price action is inherently adaptive because your actions are based on recent price movement. Generally, faster markets may allow for larger profits. We go over the specific ATR ranges to only find the best opportunities. Yes, the ATO 2, Atlas Line, and Trade Scalper are sold separately. However, Mentorship is the best way to save money and get a complete training so that you’re prepared for 2018. You’ll be taught over 10 concepts/strategies with specific rules. The DayTradeToWin support team can provide free remote support for platform/software installation and configuration, including NinjaTrader.